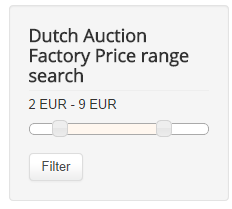 Dutch Auction Factory comes with several modules implemented that enhance and simplify the experience of your users while using the component. Clicking on any of these modules will open a control panel where you can set the status, position, title, access level (Guest, Public, Registered or Special), the location of the module in your website and more. Category Navigation module gives the possibility for users to navigate through categories and subcategories by using a simple drop-down menu system. Hovering with the cursor over Home will display all main available categories. Clicking on one of them will perform a search and display its subcategories. 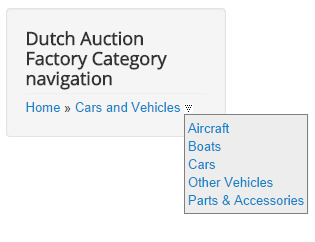 On backend you can enable a Category Counter, which will be added next to each category name, and will display the number of active auctions that can be found within that specific category. 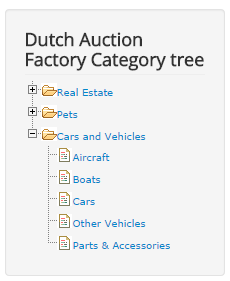 Category Tree module will add an expandable category tree which will help users find auctions easier from a specific category. Clicking on a category or subcategory will perform a search filtering only for the auctions within that respective category/subcategory. The "+" and "-" icons will help you expand/collapse the tree. From the backend, you can set the behavior of the module by setting up it's Folding speed when expanding and collapsing the subcategories. Category Counter and Subcategories Counter will display, if enabled, the number of active auctions that can be found on each category/subcategory. 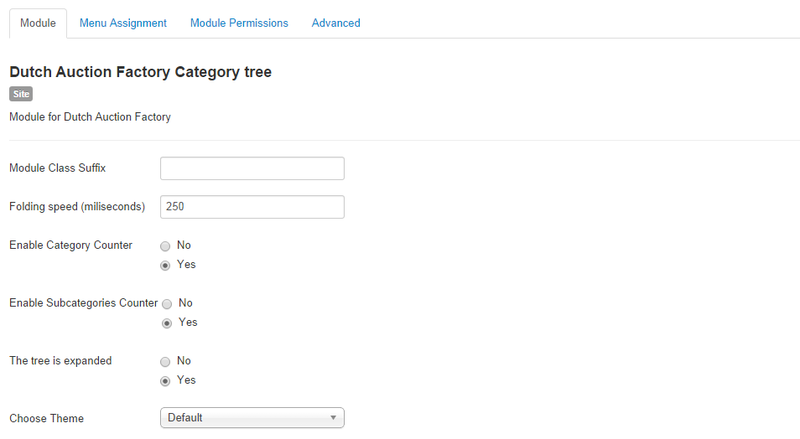 The tree is expanded option will keep the category tree expanded by default, if enabled. To further customize the appearance of the module, you can choose one of the 4 available Themes: Default, Azuro, Green or Red. Quick Search module offers users an easier-to-access alternative for the Search page. With it, users can perform searches by adding one or more keywords on the text field and by choosing a specific category. 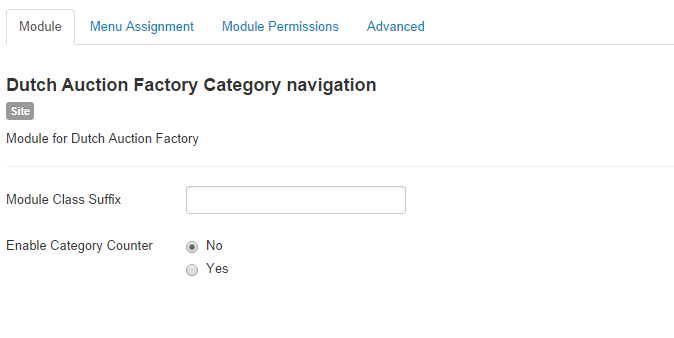 Backend area of the module allows you to choose if you wish to display or hide the Category field. With the Quick Rate module sellers and bidders can rate each other easily after finalizing an auction. The name of the buyer will be displayed on the module. By clicking on it, you can check his profile, and also see the name of the auction. To rate the respective user, simply click on one of the stars. Giving him a good rating means that the respective user was trustworthy and it will help him in further auctions. With this module, you can display various types of listings while being highly customizable. 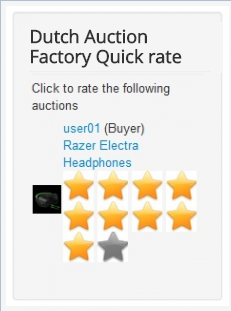 Clicking on the name of an auction will redirect you to its details page, while hovering with the cursor on it will display the sellers' name and the starting bid. There are two Templates you can choose from for this module. 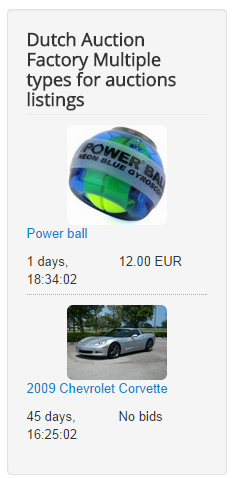 A "List" one as shown in the screenshot above, and a "Carousel" one that slides the auctions horizontally when clicking on arrows. 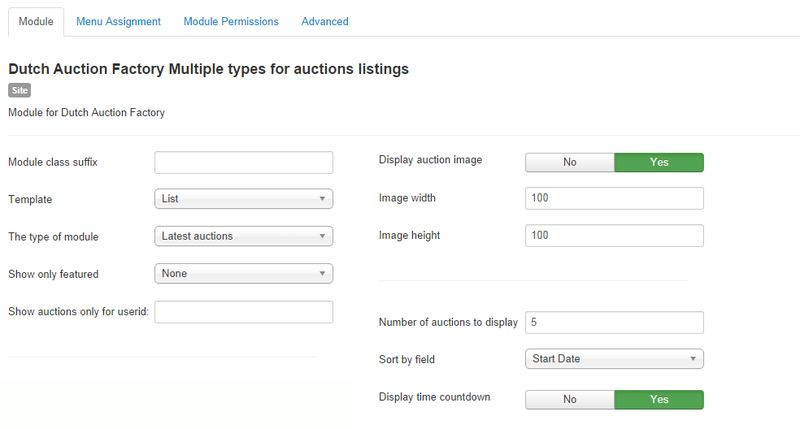 With the Type of module field, you can set up the criteria on which the auctions will be displayed. You can Duplicate this module in case you want to display more listings at once with different types. Other filtering options available are: display only Featured auctions or auctions of a user by adding his Userid. Display auction image will add images of the auction items next to their names. By enabling this you can also define the images' size in width and height. You can define how many auctions to be displayed on the module from the Number of auctions to display field and their sorting criteria (Start Date, End Date, Title or Starting Price). A Time Countdown can also be added to the module, representing the time left until the auction closes. 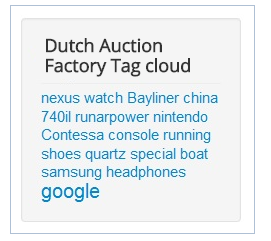 Tag Cloud module generates a cloud containing the most frequent auction tags. The size of the words represents their usage. The bigger the words are, the most used they are, while small words are less used. 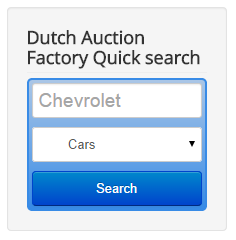 Clicking on one of them will perform a search within auctions which contain the respective tag. The maximum number of tags that can be displayed on the module can be set up from backend. With the Price Range Search module, users can search for items which have a certain price range. To modify the price range simply drag and drop the 2 little boxes found at the edge of the bar. On the configuration page of the module, you can set up the Maximum Value of the price that users can search for. However, if there are no auctions exceeding that value, it will use the value of the highest bid. The Currency on which the search performs by using the module can also be set from here. 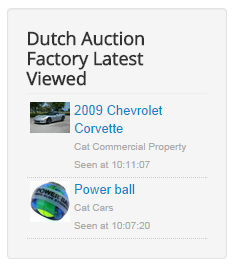 Latest Viewed module will display the latest auctions that were viewed on your website. Users will be able to see the title of the auction, its category and when it was last seen. 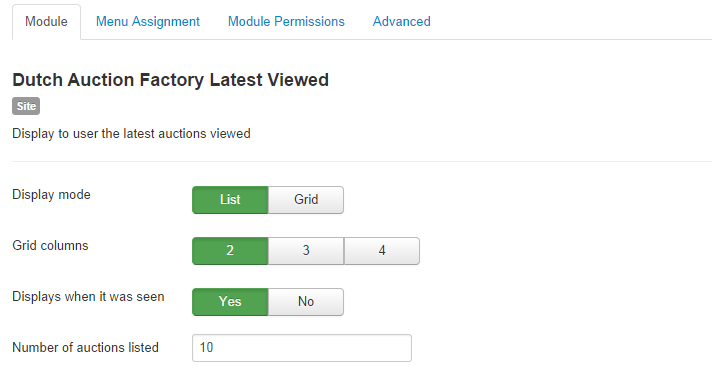 Define the display of the module on frontend by choosing to arrange the auctions as Grid or List. In case you chose Grid, you can also set the number of Columns. Displays when it was seen will list the time when the respective auctions were last viewed. Set the maximum number of auctions that will be displayed with the Number of auctions listed option.